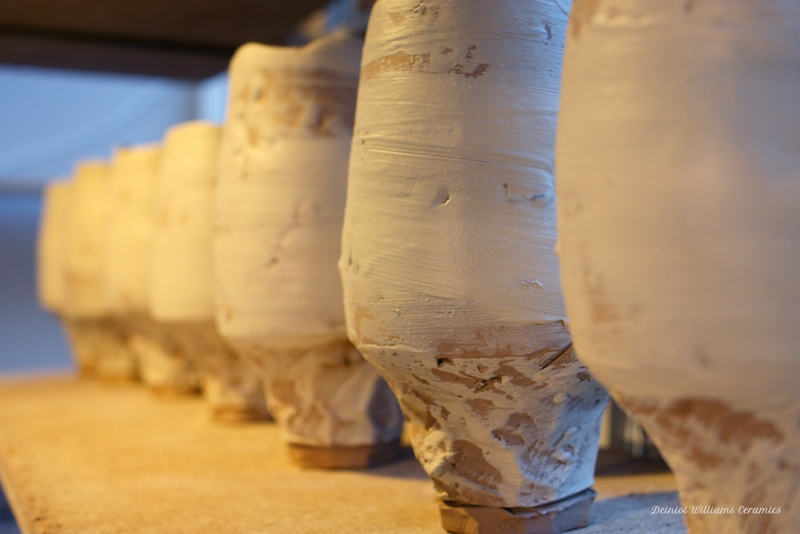 I buy a standard stoneware clay body which reacts well to wood-firing. To this, I add inclusions of various sizes, from small grit to palm-sized stones. These inclusions drastically alter how the clay behaves during the throwing and the firing, and is an aspect I have been exploring and developing over the years. The stone inclusions developed from an idea about connections with the landscape. Utilising the materials that were around me became an important aspect of my ceramic practice - clay, stones and wood are all integral to the way I work. Growing up on a farm in the hills of West Wales, I was affected by the surrounding landscape. Although I don't live there any more, I still produce work that is affected by the physical nature of the place. I mainly use stones and other debris left over from the refining of a clay I dig up on the family farm, however, I have recently begun to experiment with material local to me in West Yorkshire. The clay from the farm is an earthenware type, not very good to throw with unfortunately, but ideal for making glazes and slips. 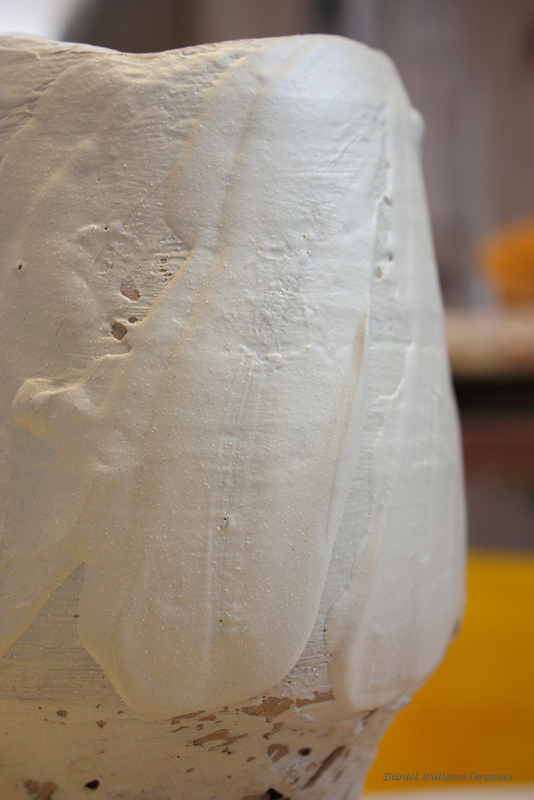 The modified clay is challenging to work with as there is no uniformity within the material. I have to be utterly focused during throwing as the pot can be torn apart at any moment if I catch a large stone with my fingers. 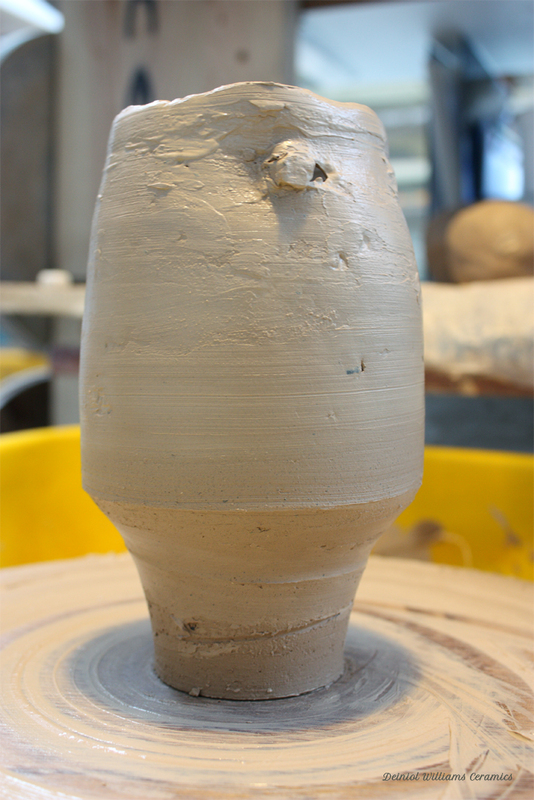 It has a way of forcing me to work the clay with the least amount of movements as possible so that I reduce the chances of the piece being torn. Almost half of the pieces don't survive the throwing, but the ones that do will then have to face the wood-firing later on. 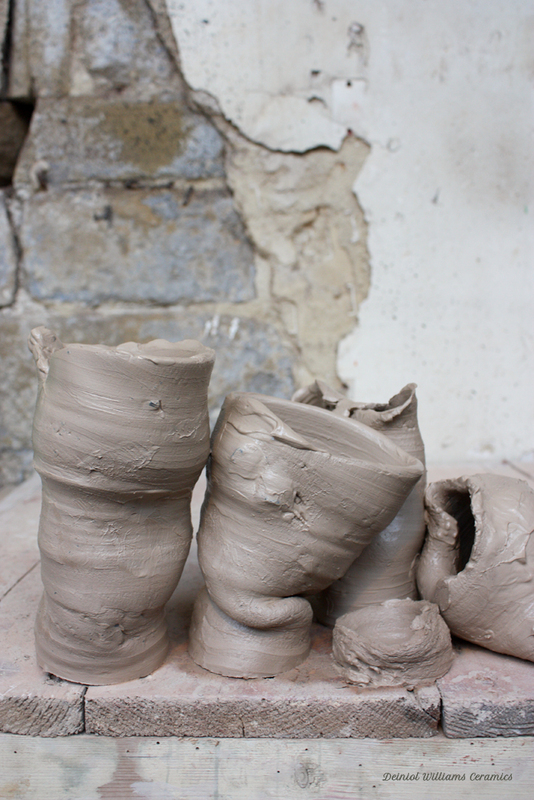 These require a different approach as the clay can distort so much that it is almost impossible to throw larger pieces. 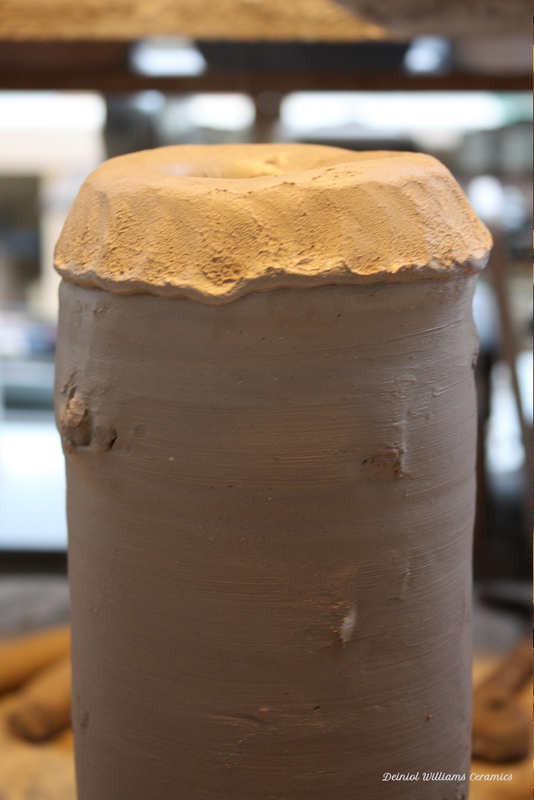 By throwing the base and then using the coil and throw technique, I can produce large and tall pieces and still have large stones within the fabric of the clay. The vessels that survive the throwing are carved while the clay is still reasonably soft (I prefer to carve the clay while it is soft). 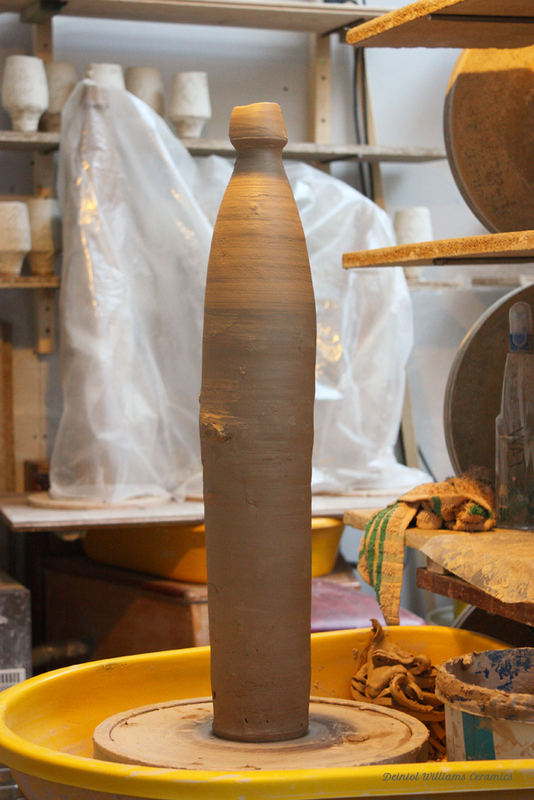 Once the pieces have firmed up a little, I will apply a white slip which contrasts to the clay body. I start off with a brush to get a coat of slip all over the piece, and then use my hands to apply thick gestural marks. I am always thinking about movement during this process. I have been using screen printing on my tile work for some time now but recently I have begun experimenting with ways to transfer the technique to my wood-fired ceramic work. I'm still working on the application technique as it can be quite tricky to get the prints to transfer from the paper and onto the work. The slip wash on the work has got to be at just the right consistency to take the transfer - not too wet, and not too dry. This is the last stage in the process before the pieces are glazed. 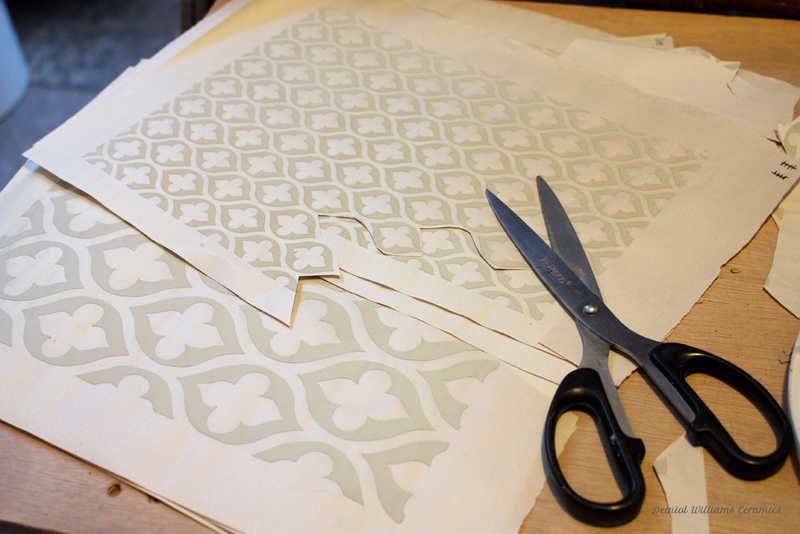 I have a blog post here that details my experimentation with screen printing transfers with clay slip.